A chance for you to meet our Management Team, and put faces to names. The Spark-Kindle-Glow project, working with communities with higher levels of isolated older people. 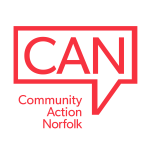 Our recent event was in the Terrington St John where Community Action Norfolk and West Norfolk Befriending hosted a community lunch. Our next event will take place in May in Litcham. Organising and delivering our energy projects in assocation with Big Energy Saving Network and Citizens Advice. Freedom oversees the Social Prescribing service in West Norfolk, our social Isolation service (CAN Connect) in North Norfolk, and the West Norfolk Housing Advice Hub. Recently, he has participated in the Improving Information and Advice events organised by the county. Freedom loves mountain holidays and cycling.